At the library, you can print popular state and federal tax forms at no charge; use library computers to file taxes online; and find resources and referrals for more specialized help. Print popular federal and state forms on demand, at no charge, from a dedicated computer station in the lobby. The most popular tax forms are saved as PDF files on the desktop. Simply click on the form or publication you need, and it will print at no charge to you. 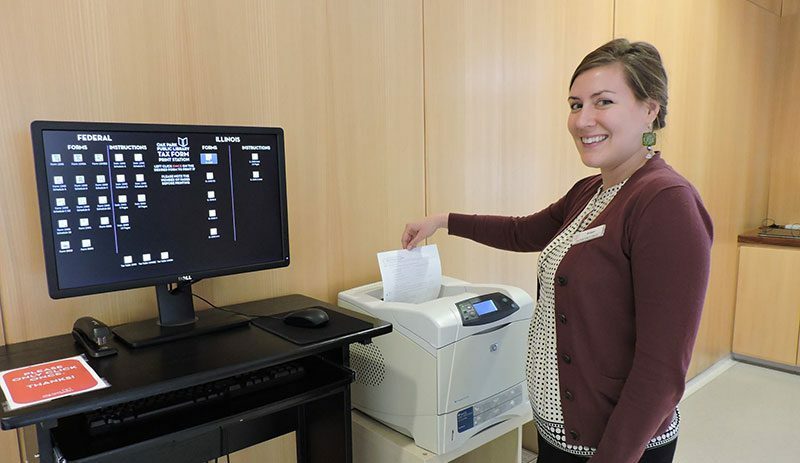 If you’re looking for forms or publications that aren’t available at the dedicated station in the lobby, stop by any service desk, and we’ll print forms for you at no charge. Ask for help at any service desk, and we’ll print forms for you at no charge. Can’t find the IRS forms you need online? To request forms to be mailed to you, call the IRS hotline at 800.829.3676. Why isn’t the library stocking paper tax forms this year? More and more taxpayers are filing their tax returns electronically. In the 2018 tax season, only around 11% of taxpayers submitted their returns on paper. Additionally, the Internal Revenue Service is no longer sending paper forms to public libraries or postal offices. To reduce our paper waste and respond to demand, we’re printing forms as customers need them. Taxpayers also can use two-hour public computer sessions to file electronic returns online. If you made $66,000 or less in 2018, you can choose to use the software that’s best for you for free, no strings attached, through IRS Free File, a partnership between the IRS and 12 brand-name tax software companies. NOTE: Oak Park and River Forest residents age 60+ who need transportation to and from Forest Park’s Howard Mohr Community Center may call the Oak Park Township’s Transportation Office at 708.383.4806.